Dichroic Charms are hand dyed resin charms with a hand twisted loop. These pictures don't do them justice. They add tons of fire and sparkle to any project. Made your own jewelry? We would love to see it! Send us an image through e-mail, or post it on our Facebook page! If you’re making your own bracelet with resin charms, you want them to stand out among the rest, be colorful, and stand the test of time. With our selection of Dichroic Resin Cabochons and Charms, you’ll be able to make your own jewelry sparkle, dazzle, and add some flare to whatever outfit you’re donning. 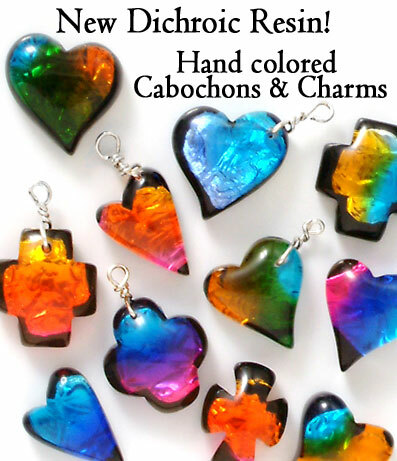 These hand-dyed charms almost look like they’ve caught a fire within, making them resemble Dichroic glass without the large cost of making them. With many different colors and shapes to choose from, who wouldn’t love a few of these blazing dichroic charms on their bracelet? Beautiful colors like blue, purple, bright orange and green all lace the different shaped resin charms within our dichroic collection. These resin cabochons come in many different types of cross and heart shapes, allowing you to pick and choose the perfect charms for your jewelry. 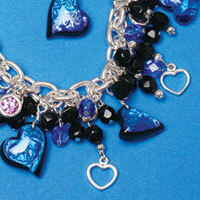 So customize your own dichroic charm bracelet today with these stunning resin charms!